No one who really knows anything about JKD doesn't recognize the name, James Y. Lee. A welder by trade, Jimmy Lee was one of Bruce's first core students. But he was much more than that. He designed much of the equipment identified with JKD practice. He introduced Bruce to the American public when, at the time, James was far more famous than Bruce. What had James become famous for? He was one of the first writers to disclose the secrets of this amazing new ability unseen in the West: the ability to break a brick with the bare hand. James was the first source, for many people of such phrases as "Iron Palm" and "Dim Mak." 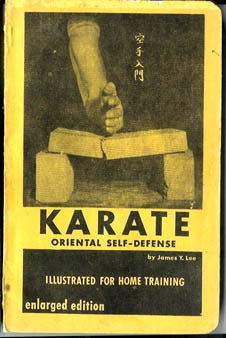 Here's an early version of a book that later became "Kung-Fu Karate." Many people wanted to bring Kung Fu to the fore but knew that KARATE was the star at the moment. Ed Parker, for instance, spent decades with the name Kenpo Karate just to make sure the public recognized where he was coming from. This wonderful early text sports a lot of Lee's great stick-figure drawings which later appeared in the much more common and famous edition shown below. Lee was a fighter. A famous story about him records that he was attacked in Oakland by a bunch of guys. Being a runner, James took off with the gang chasing him. But not all of them ran at the same speed. As the group thinned out he would turn suddenly on the leader and drop him. The last of the would-be attackers ended up sprawled out on Lee's front lawn. In a later book Lee mentions that he had seen only two real Kung Fu masters in his life, an old one and a young one. He names neither but the young one, he says, he is studying with: obviously Bruce. The old one was more than likely the well-known Bun Lau, famous instructor of Choy Lai Fut and connected to the Hop Sing Tong. And what about this hybrid of Karate and Kung Fu? Was it the first cross training? Lee liked Western boxing too. And, after all, California is the place where avocado is served on sushi.